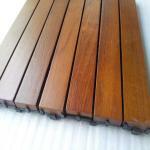 With superior weathering resistance for outdoor use,teak wood is called king of the timber used as for decking. 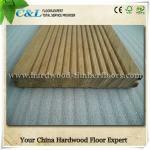 Therefore Teak decking is considered as the best hardwood decking material for outdoor projects. 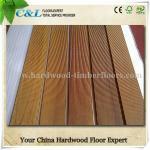 C&L hardwood in China supply Burmese(Myanmar) teak hardwood outdoor decking in various dimensions to serve the builders engaged in outside landscape constructions. Instead of Thailand teak,burma/myanmar teak is considered as one of the best teak material for outdoor decking.C&L hardwood in China source the raw material of Burma/Myanmar Teak from the plantation forest in the border areas of Yunnan in China & Burma,drying & mill the wood material in China factory to satisfy the demand of worldwide projectors & builders. Coating or Preservatives: No special preservatives or chemical coating needed for maintenance.However,if you want to prevent the teak color changing too quick,some wood oil coating for outdoor use wood is necessary. Where to use Teak decking: Swimming Pool Side,Porch,Balcony,Sea Side and Dock areas are all suitable to install the durable burma teak deck. Warranty: Above 50 years usage time in free of maintenace is possible!